Appearance: The knife as portrayed in the hieroglyph above is clearly a simple flint blade (as shown below). The flint blade was produced in Egypt from prehistoric times. Flint was probably the first stone worked by human hands into tools. Even after metal knives became common in Egypt, the flint knife was still used in religious rituals, including during mummification. Meaning: The knife was an obvious symbol of protection and retribution. Several protective deities, such as Bes and Tauret were often shown armed with knives. Guardians of the gates of the underworld, such as those shown at right were also shown bearing knives, notably of the flint type shown in the hieroglyph. The knife was also an important part of solar and lunar symbology. The knife was a part of the "follower" glyph which was shown on board the solar boat of Re. Further, Re as a cat, slew the serpent Apep with a knife when he threatened the sacred Persea tree (a symbol of the sun itself). The cresent moon was imagined to be a knife in the hand of moon-gods such as Thoth and Khonsu. 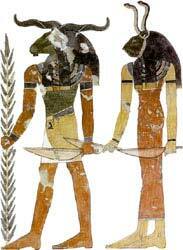 Thoth was said to destroy evildoers with the cresent moon as his weapon. Due to the magic inherent in images of the knife, malevolent creatures such as scorpions and snakes were often depicted cut with knives to render them powerless.